No matter the make or model of your car, your tires are your only connection to the road, which makes them essential to performance, not to mention safety. Depending on your needs and budget, it is easy to find cheap tires in Cincinnati. Finding the right ones for your vehicle is crucial, but doesn’t need to break the bank. For optimal performance and safety, whether purchasing for the first time or replacing your tires, it’s crucial to consider tire size and season (summer, winter, all-weather), and ensure that whatever you choose is a complete and matching set. Mix and matching different sizes or seasons is ill-advised. All four tires should match in order to deliver the support, handling, and safety for which they were designed. Speaking of design, tire manufacturers consistently work to enhance tire performance and service, while reducing cost. Tire innovation is aimed at protecting drivers and passengers, saving lives, and improving overall vehicle performance. The environment increasingly plays a role in tire innovation as Research and Development engineers are currently focused on sustainability and fuel economy. But, just how much innovation is possible when it comes to tire technology? How many times can we reinvent the wheel? Turns out, (get it? ), the possibilities might just be endless. Several major tire manufacturers have introduced a new phrase into the automotive tech-lingo: concept tires. Why not? With concept cars all the rage in engineering, concept tires seem an obvious opportunity for exploration. Goodyear, Nokian, Hankook, and Bridgestone, have all conceived of concept tires, putting a new spin (I’ll stop!) on tire technology. The American and third largest tire manufacturer in the world, Goodyear, has conceived of not one, but two, concept tires. First, the BH03 concept tire. Hardly an inspiring name, given its capability. This tire generates electricity. One more time. 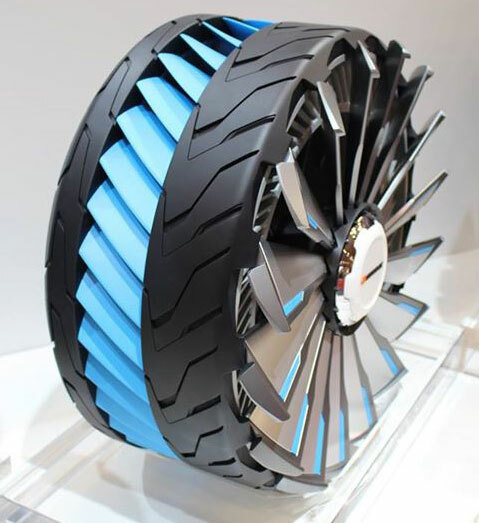 This tire generates electricity. How? Well, simply by harnessing the heat created by flexing during typical driving conditions. If applied to hybrids and electric cars, this additional source of electricity could result in improved efficiency, which would certainly impact the EV division of the automotive industry. Not stopping there, Goodyear went on to envision the shape-shifting Triple Tube. A shape-shifter. Sounds almost ridiculous, right? Well, the technology is clever and cutting-edge. Three internal tubes allow for shape modification, depending on driving conditions. Found under the tread and close to the center of the tire, inboard, and outboard shoulders, this tire morphs into three different positions via a pump, which moves air in between the tubes. The three shape-shifts, or modes are Eco/Safety, Wet Traction, and Sporty. In Eco/Safety mode, the tubes fully inflate, decreasing rolling resistance. Wet weather is no match for the Wet Traction mode, in which the center tube inflates to cut down on the risk of aquaplaning. Shifting into Sporty mode, air pumps to the inboard tube to enhance contact patch and increase grip. These tires are not available…yet. They are, as their names suggest, just a concept for now. A theory, not yet a practice of purchasable product. 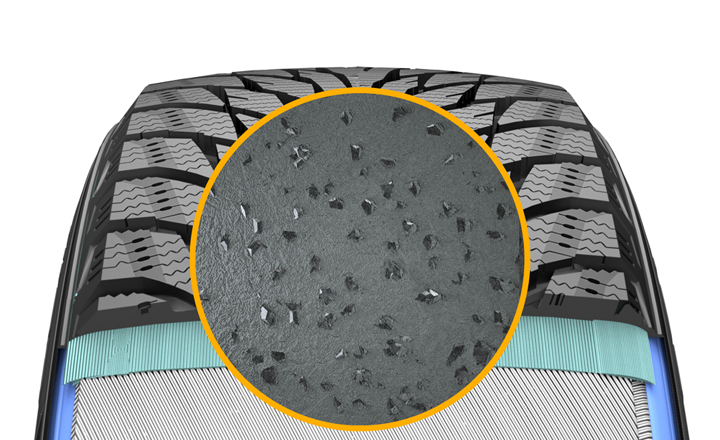 Nokian, the Finnish tire manufacturer, which has recently moved from eleventh to seventh of the world’s largest tire manufacturer’s, has created a tire that seemingly solves the concerns surrounding studded tires. Controversial, safety and environmental concerns, studded tires have been restricted, even banned in some states, and have inspired lighter-weight stud legislation. Brand new, studded tires prove beneficial on icy roads and in freezing or near-freezing temperatures.However, they can pose a threat to traction in warmer, wet or dry conditions, and on various pavement types. With a questionable safety record – it’s difficult to evaluate, due to uncontrollable variables like driver behavior and perception – there was a quiet call for innovation and Nokian answered, releasing its response in the fall of 2013 to the Nordic markets of Russia and Ukraine. The Nokian Cryo Crystal is non-studded, but stud-like. Microscopic, multi-edge, crystal-like particles are diamond-tough and built into, rather than onto, the rubber compound. This technology increases the tire’s lateral and longitudinal grip, which is particularly evident on icy and slick conditions. Equipped with this technology, tested tires were able to stop several meters quicker from 50 mph than their studly predecessors. 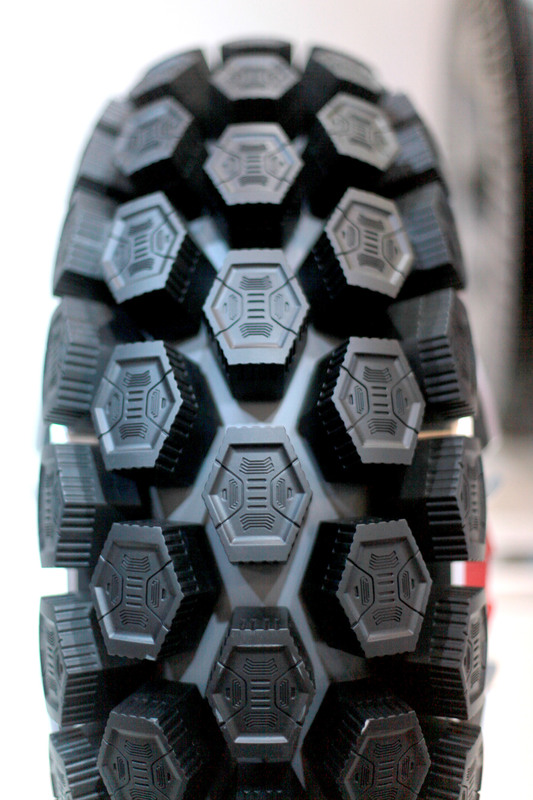 Wear and tear, a concern for stud tires, is practically nonexistent for the Cryo Crystal. Wear on this tire actually brings the internal eco-friendly particles to the tire’s surface, increasing the tire’s grip. Precision and grip are safeguarded against age, where they can be compromised on a stud tire as it is increasingly used. Cryo-Silance, a winter silica compound able to withstand a range of temperatures and wet or dry conditions, is a key component of this technology, making the Cryo Crystal seriously durable. Not to be confused with Goodyear’s shape-shifters, South Korea’s Hankook tire manufacturer, has designed what it calls shape changers. Unveiled at Germany’s Essen Motor Show last December, these concept changers were borne of the Design Innovation Project. Every two years, Hankook pairs with a university to work on tire innovation. In 2014, Hankook selected the University of Design, Engineering, and Business, in Pforzheim, Germany. The results are fantastic, in the fantasy sort of way. The trio of dynamic shape-changers are able to alter performance, no matter how quickly or unexpectedly the terrain beneath them changes. The Boostrac is reminiscent of a dune buggy-type wheel. Its hexagonal tread blocks are able to expand and switch traction to move through sand or tackle steep grades, typical of mountain terrains. 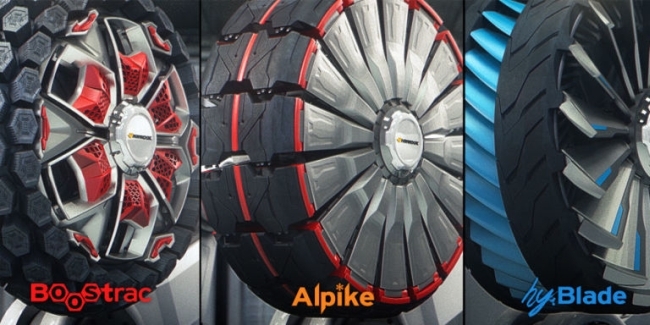 The Alpike is essentially a revamped snow tire, only cooler. Capable of expanding its own circumference, as it expands the spaces between the tread and exposed studs are better able to grip icy surfaces, making it an ideal winter tire. The HyBlade looks very much like a water wheel and with good reason. It basically is. The design features pop out fins which paddle through water, not unlike a riverboat. 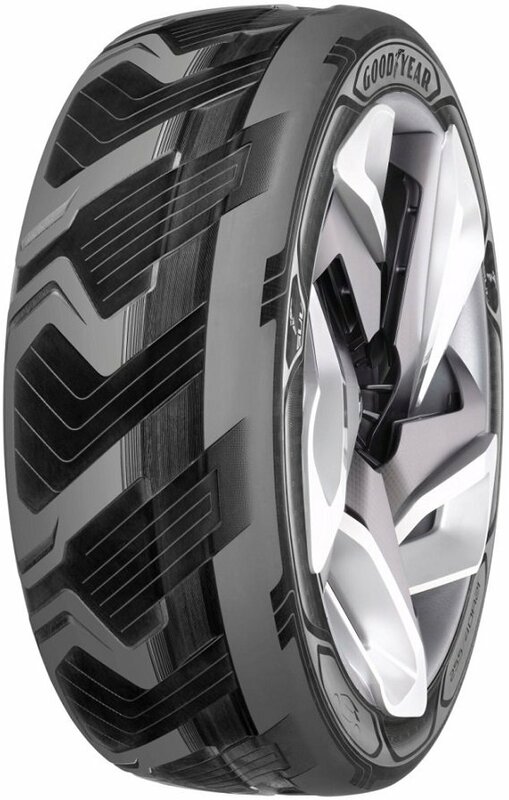 Like the Goodyear concepts, these tires are visions…for now. Though not available in the near future, they might just be a reality in the not-too-distant future. Finally, Bridgestone, the Japanese and premier tire manufacturer, has tweaked its original non-pneumatic tire and created the Air-Free tire. Introduced at the 43 Tokyo Motor Show in 2013, this air-free technology features an environmentally-conscious design, enhanced load-bearing capabilities, and improved driving performance. Bridgestone, dedicated to striking a balance between its business and the environment, stresses a “cradle to cradle” creation model, in which worn tires are recycled into new lives. Basically, we’re talking tire reincarnation here. The recycled materials have been reincarnated into a new spoke structure made from thermoplastic resin 1. It is this structure, rather than air pressure, which supports the weight of a vehicle. Eliminating the need for regular air refills, the structure results in less frequent tire maintenance and minimal, practically nonexistent, threat of punctures. No more flat tires! Already environmentally-friendly with its use of recycled materials, this tire is also energy-efficient. 90% of energy loss from tire rolling resistance results from repetitive shape changes as the tires roll. This innovative structure supports low rolling resistance, which decreases C02 emissions. The thermoplastic resin is very strong, but very flexible. In FEM (finite element method) simulations, the resin resulted in less stress and deformation on the tire’s interior. This means enhanced versatility, increased load-bearing and driving performance. More modifications and developments are needed before Bridgestone can successfully release these on the market. However, there is speculation that these airless tires will be available for purchase within a decade. Hurry up and wait…but not for long! 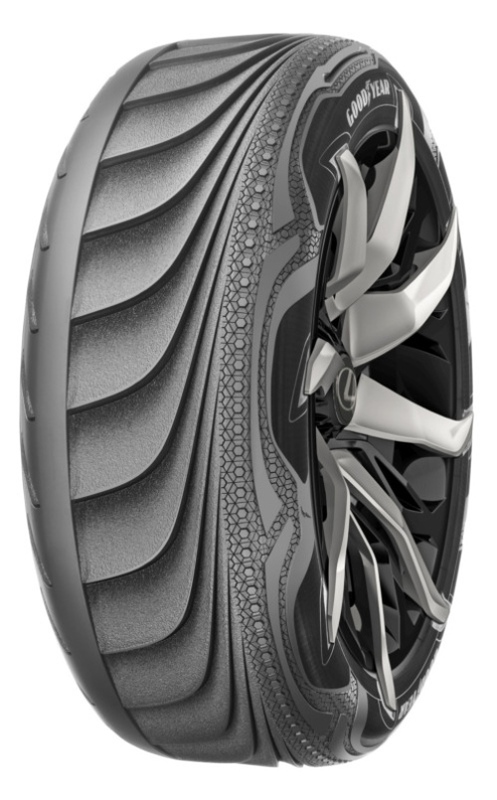 Although scientifically-based, these tires appear more sci-fi and far-off futuristic. But, the future is upon us and these technologies will soon be present. In the meantime, check the condition of your tires and and make tire maintenance a priority. The performance of your vehicle and the safety of its occupants depends on them.